This multisensory reading, spelling and penmanship program builds an association between symbols and sounds in the English language through self-paced repetition. It utilizes the close association of visual, auditory and kinesthetic elements to help students improve their language skills. The beginning of the usage of this Android App assumes the student does not know the letters of the alphabet. The program then proceeds to teach all the skills one needs to read on a sixth grade level. The sound & key word for each letter of the alphabet. 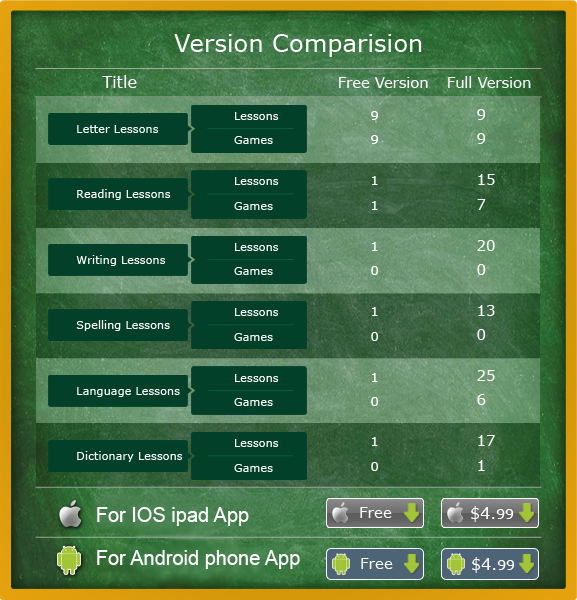 Extensive practice in reading, spelling and penmanship throughout the usage of Android App.